Vegan and amazingly delicious. You have to try it. 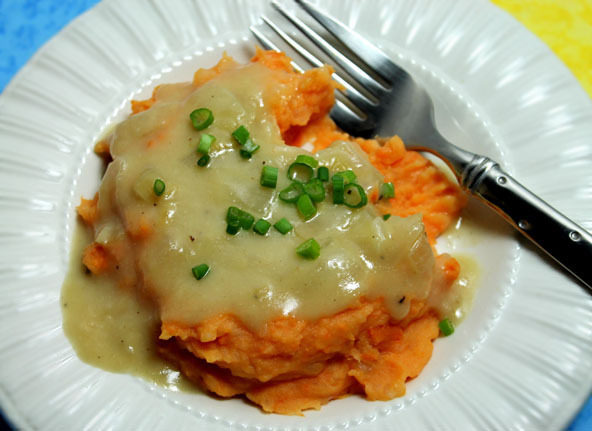 This gravy couldn’t be better for you. It’s loaded with onions and mushrooms blended up with vegetable broth and a touch of garlic to make the most amazingly delicious gravy. It’s grain-fee and made simply with real whole super healthy foods. This is one nice gravy recipe. Try it served over Colorful Pizzaz Potatoes or Diary-Free Roasted Garlic Potatoes. Dice the mushrooms and stir them in with the onions. Saute for 1 or 2 minutes. Add more coconut oil if needed at this time to keep the mixture from sticking to the pan. Contine sautéing for 1 or 2 more minutes and then remove from the heat. 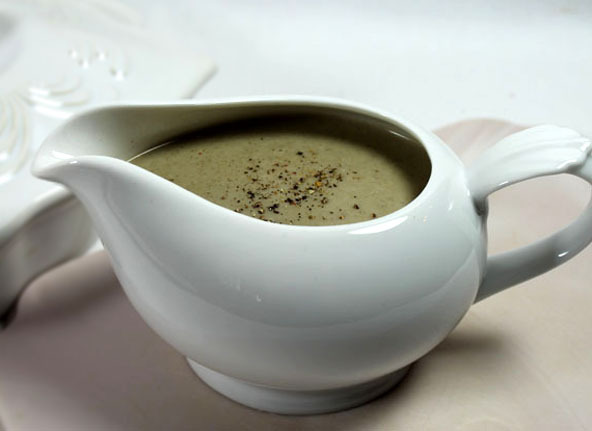 Add one cup of broth to a blender along with the onion/mushroom mixture. Blend until smooth or to your desired consistency. Add the remaining cup of broth and your choice of milk and stir over medium-low heat. If you want, you can keep it at a very low temperature on the stove and let it reduce somewhat for a thicker gravy and to keep it hot while the rest of the dinner is being prepared.